Four students and alumni from the University of Malaya (UM) have earned themselves the honour of representing the University to further compete at Klang Valley level. The annual occasion of University of Malaya Toastmasters Club International Speech and Table Topics Contest was held at Faculty of Engineering on 19 December 2018. 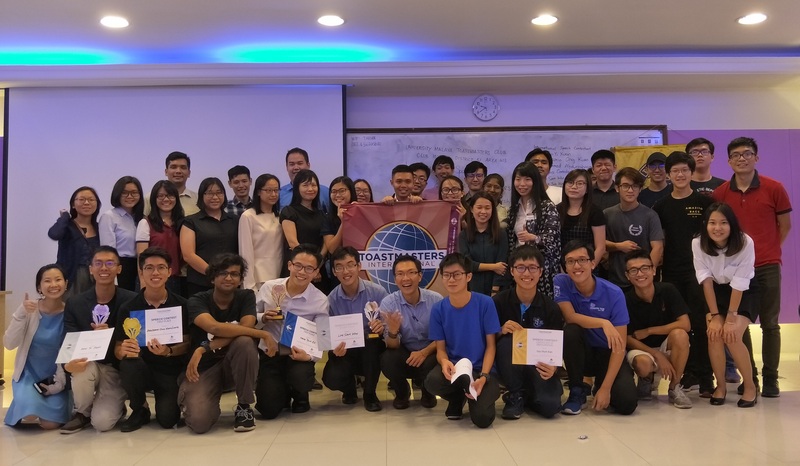 About 40 people including 30 students and alumni from UM and members from other Toastmasters Club across Klang Valley gathered together for one purpose – to get inspire! The contest combines two of five annual speech contests in the Toastmasters International, during which members compete to complete their journey as a Toastmaster. The International Speech is a 5 to 7-minute speech on any subject, whereas, the Table Topics contest requires the contestant to deliver a one to two minute of speech based on the topic given on the spot. Benjamin Ong, 19, just embarked his public speaking journey six months ago, wowed the judges with his 5-minute speech on ‘Stand up’, talking about his personal story and a strong message behind on standing up for others. “I just want to break the stereotype among engineers who cannot speak fluently. I didn’t expect to beat the other finalists. I will try my best to make University of Malaya proud in the next level contest,” said Benjamin Ong, who is an Engineering student. Shawn Keng, 29, a member from the club, currently working in science industry was crowned first place for the Table Topics Contest. His clear, concise, and clever impromptu response to the statement, "Home is where the heart is" helped him to excel during the contest. He shared his personal stories about the after-marriage relationship with his mother and successfully captivated judges’ hearts. 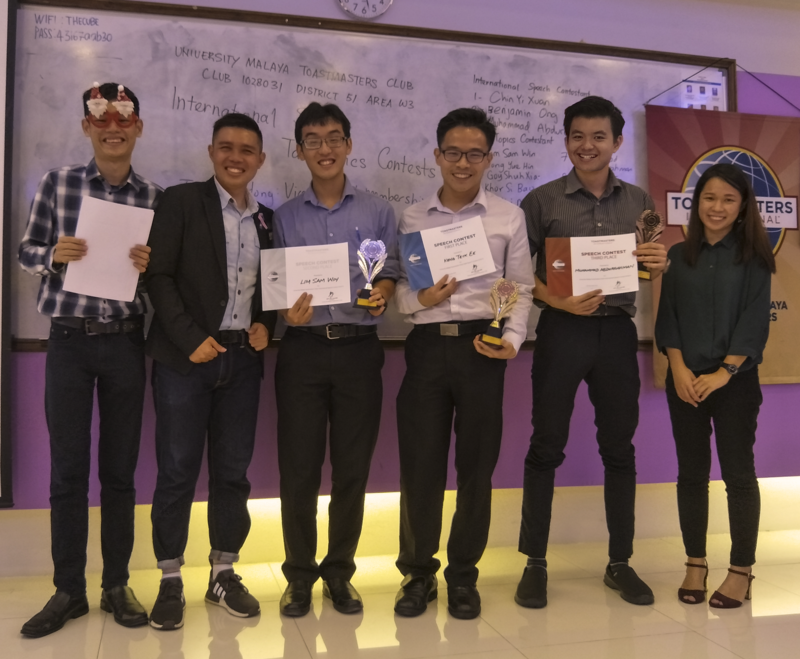 The winners for International Speech Contest were Benjamin Ong (1st Place), Chin Yi Xuan (2nd Place) and Muhammad Abdurrahman (3rd Place), while Table Topics Contest’s winners were Shawn Keng (1st Place), Lim Sam Win (2nd Place) followed by Muhammad Abdurrahman (3rd Place). 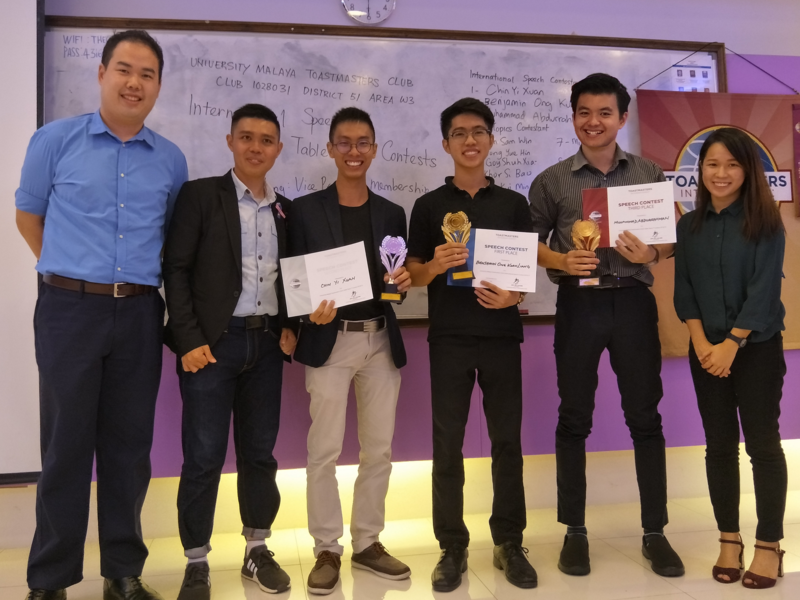 1st and 2nd Place winners from each category will represent UM in competing their speech with other proficient speakers from Kijang Toastmasters Club, Telekom Malaysia Toastmasters Club and PIDM (Perbadanan Insurans Deposit Malaysia) Toastmasters Club in Area W3 contest.